Ok, on to my latest piece.......PVC dripping in beads!!!! Mmmmm - yummy! Hoping to get a photo shoot under way as asap......and I also have another PVC corset to finish - though this one is more colourful and has tails (think military/ringleader). I have so many things planned, half finished and on the go, I really wish I could clone myself and truly take flight!!! LOL yes I'm a small time designer living in a big world always trying to meet the ambitious marks set either by myself or others (of course all this while wearing my PJ's at camp 'mother nutter'). 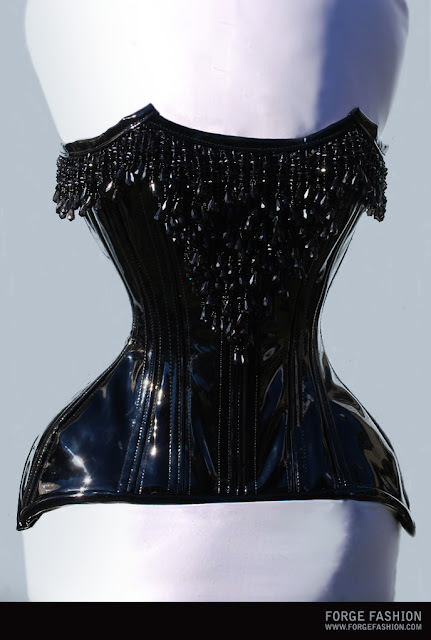 Anyway, customer orders coming up include an a full costume for one of our local burlesque girls, a lovely lace covered overbust, a steampunk overbust and something tasty for the lovely tightlacing Kathy Chin.